A copy was provided by the author for a honest review. 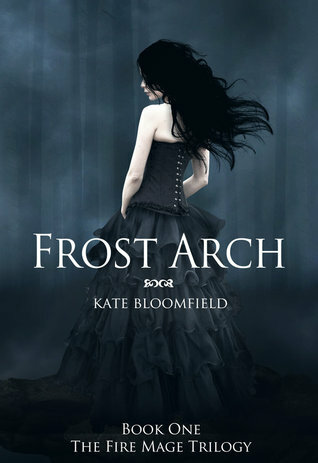 Frost Arch was an excellent read. It has minor flaws but kept me interested, nonetheless. Avalon Redding powers are wild and uncontrollable and fears that she will harm her sister, so runs away from home. Avalon has escaped to Frost Arch. At the same time, she finds an unusual creature in a cargo. It's a fox with wings. She can't hide it forever though. It's rapidly growing. Our protagonist, Avalon Redding, is the one thing i am not sure about. I don't know if i like her or not. Now and then, she is reckless and sometimes she is sensible and mature. On the other hand, i thought Jack was mature and sensible but was humorous when the story needed it. I also liked Raeven and Seth Swaggart. Both of their characters were mysterious and intriguing at the same time. Although, i really liked Seth Swaggart i couldn't really fully appreciate his character, because he wasn't in the book most of the time. Plot wise i thought that it was interesting and fascinating. What i was really interested about when i first read about it was how humans were slaves to the mages and how this was set in the far future. Contrarily, there was nothing about where the story was set. The pace of the story was great, regardless the rushed start. But it soon became steady and flowed nicely through out the story, so i didn't mind it much. Despite, the minor flaws in all of the topics, Frost Arch, overall, was a enjoyable read with a engaging story line with a great, steady pace. The characters were all fun to know about. I would recommend to read it if you ever get a chance, or get your own copy and read it now. It's frustrating when you're not sure if you like the main character or not. That's always something you want to do. For some reason the plot makes me think of Planet of the Apes. Never heard of this book...will be checking out now! Seems like a great read. I also really like the cover, which makes me want to buy it right now!